Flea markets seem to be really popular nowadays. There are large ones, small ones, simple ones, and fancy ones. Not being an expert on this form of retail business, I have a hard time telling the difference between a small flea market and a big yard sale. Both of them have items of relative interest only to those who have some particular use for the items even if it’s just for resale. I guess yard sales are the more personal of the two. That’s why I was surprised to see a photograph album at a large flea market down near Myrtle Beach. There were no empty pages, only page after page of pictures of what appeared to be a family. The pictures had all turned that light tan, sepia color that tells you that the pictures were taken a long time ago. Of course, just looking at the images in the pictures, the people and buildings and automobiles, etc, you could tell that a lot of yesterdays had passed since they were taken. Since the album was such a personal item, what would have caused a person to discard such a thing? After all, we are all a part of our families and throwing away or selling something that is a kind of record of that family is like disposing of a part of our selves. Judging from the model of the cars and the way folks were dressed in the photos, I guessed that the album covered about thirty years of that family’s life. There were scenes much like those that we see in every family album: women (probably mothers) holding up little infants wrapped in blankets, boys and girls lined up as if for inspection in their finest Sunday (probably Easter) clothes and a group shot of what appears to be about four female generations sitting around a picnic table. I wondered about the stories that went with those pictures. There was one of a young man dressed in a Navy uniform. He had one foot on the running board (remember those) of a car. He had one arm resting on the open window of the car and the other wrapped posessively around a young lady. I wondered how many similar pictures had been taken over the years of young military men home for a visit and how many of them never came back home again for another picture. There were several pictures of young people in caps and gowns, some posing for the photograph and some receiving a diploma. I wondered what they did with their lives after they graduated from school. How many of them were successful? How many struggled and failed? Wedding pictures took up a large part of the album. Some photographs were of large wedding parties standing together inside a church. There were smiling pictures of the bride and groom eating cake and one of a bride throwing her bouquet and another of the bride and groom running through a shower of rice. I wondered how many of them were still married. How many children did they have? As I looked through that album, I realized that it could belong to almost any family. The pictures I saw were much like photos in every household in the country. Those photos depicted those places and occasions that make up family life in families like yours and mine. Those images recorded passing moments that, sewn together, created a tapestry of human existence. So why had that album be discarded? Why would anybody not want to keep those images, to not have some tangible recollection of who they are? I asked the lady who was tending the stall how she happened to have the album for sale. She said it came as part of an estate sale for a lady in Greensboro who had died and had no relatives. Here was a record of a family that exists now only in faded photographs. The first time that I attended an estate sale, I saw a box of old photograph in fancy hand made frames-Well, it broke my heart to see these treasures in a box for all of three dollars. You know i bought them. loved your post and am so glad that I can read your writing regularly-best wishes!! 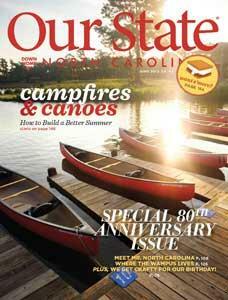 Bill Thompson is a featured writer for Our State, a magazine that celebrates the people and places that make North Carolina great. From the mountains to the coast, Our State features North Carolina travel, history, folklore and beautiful scenic photography. Click here to read his articles here. The mission of Boys and Girls Homes of North Carolina is to provide residential and foster care/adoption programs for neglected, abused and hurting children that emphasize academic and Christian education to address their physical, emotional, social and spiritual needs in a homelike, Christian setting. Bill Thompson retired as president of the Boys and Girls Homes of North Carolina in 2007.